With just over a month until training camp gets under way in Kamloops, what better time for a blog about what’s been happening in and around the Lions Den in the last few weeks. Ryan Phillips gave back to the community with his charity basketball game featuring the likes of Geroy Simon, Travis Lulay, Paris Jackson, Ernest Jackson, Adam Bighill, Andrew Harris, Courtney Taylor and others playing basketball against local DJ’s in support of Make a Wish in BC and the Yukon. “Dunks for Dreams” is just another example of how involved the Lions players are in the community all year round. The Lions which will hold a three day mini-camp at their Surrey practice facility this week. The camp will only feature offensive players, as the team tries to insert the offence of new coordinator Khari Jones and see what they have with the QB’s they have assembled heading into 2014. One of the key questions heading into Kamloops is who will emerge as the Lions backup to Travis Lulay to start the season. Chris Hart will be one of those players vying for the job and seemed excited on Twitter after initial meetings heading into this mini-camp. Also on display will be four import offensive linemen recently signed by the team, who will look to compete for the tackle position vacated with the retirement of Ben Archibald. The Lions are reportedly exploring the possibility of bringing back defensive tackle Khalif Mitchell. 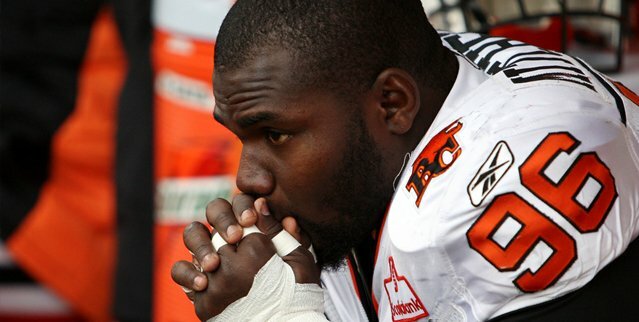 Mitchell who was traded to the Toronto Argonauts last off-season when he wore out his welcome with the Lions coaches and players, was released by Toronto to explore his options this off-season. It was reported that exploring would be south of the border, but with no workouts publicized, it seems as though Mitchell may be looking to move back out west and the Lions are at least doing their due diligence. It would be a touchy decision for the club. There were players that were quite vocal about Mitchell during his last tour here, but there is no denying the presence he provides in the middle of a defensive line. Fresh on the Lions is mind is the fourth quarter in their semi-final game in Regina last season, where Darian Durant parted the seas and ran up the middle to end the Lions season. Yes, Mitchell made mistakes in his first tour in BC and if he returns there will be a very short leash. He’s still a young man and people can change. Anyone that has had dealings with Mitchell away from the football field has seen the gentle side to the giant. If he can concentrate on being a good football player and team-mate, another look would be welcomed by this fan. Once again the BC Lions will hold and ticket event for their season ticket holders at BC Place. This year’s event goes on May 25th. Fans will be able to listen to Dennis Skulsky, Wally Buono, coach Benevides and his staff talk about the upcoming season and they will be able to pick up their season ticket packages. There will be complimentary food and concession items and the latest merchandise for 2014 will be on sale at a discount. BC Lions players will be on hand as will the Grey Cup, and fans will be able to get autographs and have their picture taken with the cup. You should have received an e-mail from the Lions about the event if you are a season ticket holder, and if you aren’t there is still time to get on board to support the pride and guarantee your ticket for the 102nd Grey Cup game in November. Ticket sales for the November classic have been reported as brisk, with ticket holders from other CFL teams getting in on the action last weekend. Public sales begin in June. The BC Lions recently posted some photos from the annual Felions calendar shoot but it didn’t take long for the ugly side of social to show itself. Classless keyboard warriors made fun of the girls appearances, questioned their intelligence and work ethic and referred to them as “Surrey Trash”. Others questioned whether the shoot was in contradiction of the Lions “Be More Than a Bystander” program. No, I’m not kidding. People are entitled to their opinions, and they sure are brave when they have no one to answer to for their comments. The fact is these calendars help pay for these girls to finance their Grey Cup expenses. They volunteer as Felions, and represent the team at a ton of functions all over the city and occasionally the province. Regardless of what you think of dance teams, cheerleaders and how they are portrayed, no one is forcing these girls to do anything and they certainly don’t deserve to be belittled for their efforts. As one fan pointed out, no one seems to complain when the annual Firemen’s calendar is sold each year. Congratulations to a friend of the site, Tyler Bieber for getting hired on at 107.5 Bolt FM in Humboldt, SK. You might know him from his blog CFLDaily.ca or from Twitter @CFLDaily. Tyler is a talented young man and we wish him well in this next step in his career. He’s been a guest on our pawdcast, and assures us he won’t forget us lowly bloggers now that he is mainstream media! We’ll talk more about these topics and some others on the next episode of the BCLionsDen.ca Pawdcast, where we also hope to get an update from the Grey Cup champions in Regina. Until then, Roar you Lions roar!